It is important to take electrical problems in your home very seriously. A defective wiring issue can be dangerous to you and your family, creating a fire hazard as well as the potential for electrical shock. In addition, the inconvenience of a faulty outlet or lighting fixture can be significant, especially if it affects your everyday activities. Being able to spot the signs of a potential electrical problem early on can help to prevent these issues from growing. Some electrical problems may seem inconsequential, such as a loose-fitting or warm switch plate. However, understanding the danger these could pose can help you take timely action. Other problems are more obvious, such as your power frequently tripping, or an outlet causing electric shocks. Make sure to call in an electrician for any potentially hazardous work on your home. Learning what causes these issues can help you determine the type of help you need to seek out to fix the problem. This sign can be among the easiest to detect when you have electrical problems, as your lights may noticeably flicker or dim with no apparent explanation. This can be caused by an issue with the bulb. Try replacing the bulb first before calling for assistance, and make sure the bulb is sitting tightly in the socket. If the problem continues, it might be that the connection contacts in the socket are worn. There could also be a loose connection in the wiring of the fixture. However, these issues could also indicate a larger problem with the electrical systems in the house, requiring extensive repairs. If your lights dim whenever you use a certain appliance, it could mean there are too many appliances and fixtures relying on a single circuit. This issue may occur when you are using a large appliance such as a washer, dryer or space heater. In this case, you may need to have your circuit connections rearranged, or a new line put in, to prevent the problem from continuing. Experiencing some odors when using a new appliance is relatively common. However, a strong smell of burning is an immediate cause for concern. If you are uncertain as to where the problem is, you can use the smell to help you locate it. The problem may be with a faulty appliance that needs to be unplugged. However, it could also be an outlet, or even your electrical panel. Note that the smell could indicate an imminent fire hazard, and should be dealt with at once. Sometimes, noises can give away an electrical problem as well. A noise such as buzzing or popping could indicate that there is a loose connection, as the power jumps across the break. This may be found at a faulty outlet, for example. Make sure to follow the sound in order to determine where the issue lies, and then stop using that connection. Scorch marks and discoloration around outlets and switches. Melted plastic housing for electrical connections. Smoke released from electrical connections. All bulbs will burn out eventually. However, if yours are burning out more quickly than they should, it could indicate a problem with your voltage. You can test the voltage yourself using a multimeter, but make sure to take the proper safety precautions. If the voltage is too high, then you will need an electrician to deal with the problem. However, it is also possible that you are using the wrong voltage of bulb. A bulb with too high a voltage can result in additional heat generation, bulb burnout and a damaged fitting. As such, make sure to check the voltage before installing new bulbs. If your outlet is loose, the plugs you place inside it will fall out. This will leave them partially exposed, presenting a serious danger of electrical shocks. It is best to stop using these outlets until you can have them fixed or replaced. 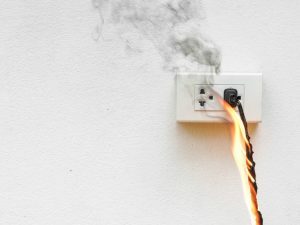 An appliance might cause a few sparks at a connection when it is plugged into an electrical outlet. If the sparking occurs when you are using an appliance, you may need to test the appliance. However, continual sparking is a problem, as it can indicate a number of issues. You may have loose wiring, a short circuit, or damage to the overall system. Sparking that occurs at a connection such as an outlet, breaker panel or fuse should be fixed immediately by a professional. Any type of electrical shock should be taken very seriously. While static shocks in the home may be common, shocks when touching electrical outlets may indicate a ground fault or short circuit. This means the electricity in your system is flowing somewhere it should not. As a result, there is an increased risk of an electrical fire, as well as a danger of more serious shocks to you and your family. Your circuit breaker is designed to trip in order to prevent power overloads, or other issues affecting your entire electrical system. You may notice that faulty appliances will cause trips, for example. However, if your breaker trips frequently with no noticeable reason, there could be an underlying issue. This may lie somewhere in the wiring of your home, or in the circuit breaker itself. There could be an issue with moisture, wear and tear, or using the wrong type of breakers. Your electrician may need to assess your entire system in order to find the problem. If you spot signs indicating you may have rodents in your home, it is worth checking for damage to your wiring. Rats and mice will often chew on wires, causing damage that remains unseen and can develop into substantial problems.